In website almost all sites use contact form to get feedback about product or other information. But in mobile application, there may not be use of contact form in all applications. In android, feedback can be got directly from PlayStore. 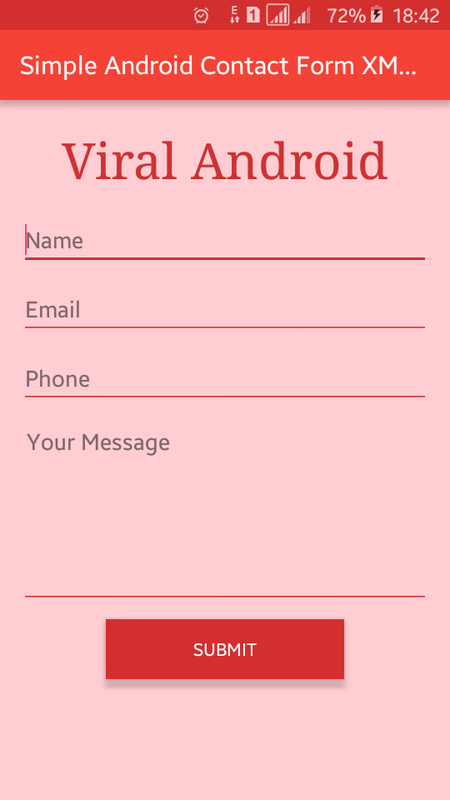 In this tutorial, I am going to show how to create a simple contact form UI design for android application only using XML. Here you will learn to make simple contact form UI design; we are not working with java programming and any database, here is only XML code. Following is the content of XML layout file, colors.xml file, strings.xml file and default code of java activity file. In the XML layout file I have added several EditText for name, email, phone and message. And also I have added a TextView for title & a button for submitting the information. Following is the complete content of XML layout file. Here I have defined color value for status bar, ActionBar/AppBar/Toolbar and other color also. Now, run your Simple Android Contact Form XML UI Design application, which will look like above screenshot.